TUFF PLAST is brilliant white , white cement based putty for internal and external use . it has excellent adhesive strength providing long lasting bse for paints . Dosage/Coverage 2 to 2.5 m per kg per mm in double coat. 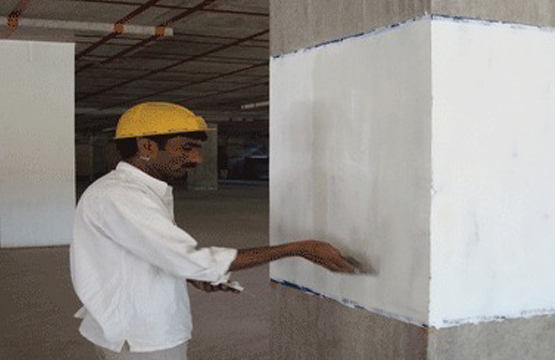 It is water resistant fills micro pores and hair cracks of plaster and provides smooth , dry and brilliant white surface for applying any kind of paint over it .can be used over conventional building area sand cement plaster level brick work exposed concrete, plywood AC sheets gypsum boards ,etc. TUFF PLAST GP is pre mixed premium quality gypsum based plaster. Dosage /Coverage 15 sq ft from 25 kg bag at thickness of 15 mm thick. TUFF PLAST GP is for internal application where normal humidity prevails .it has simple application smooth finish. TUFF PLAST RMP is ready –mix plaster for interior and exterior application. Dosage /Coverage 1.5m-2m from 25kg bag thickness of 10mm . TUFF PLAST (AP) is acrylic polymer based ready to use wall putty . Dosage/Coverage 1kg covers 7m-9m at 1mm thickness. Perfect thixotropic adhesion, consistency for working , excellent finish can be used over conventional building area sand cement plaster level brick work exposed concrete, plywood Ac sheets gypsum boards etc.